Saturday I crossed two things off my list that I should have done before, but hadn't. Killed two birds with one stone actually: finally made a visit to Breakside Brewing, and took part for the first time in Zwickelmania -- the Oregon Brewers Guild's annual event where breweries offer tours that include tastes of beer which is still in the fermenter. Thanks to Kerry for inviting me to meet him at Breakside, otherwise I might still be in my benighted pre-Breakside and pre-Zwickelmania condition. Breakside covers a lot of bases. For starters, it serves a funky little neighborhood that doesn't have many other good beer choices. In a town with 40 breweries, there's not one within a mile of Breakside. The spirit of experimentation is strong there, too. Instead of looking on the brewery's small 3-barrel system as an impediment, brewer Ben Edmunds turns it to his advantage by turning out small batches of playful experiments that he might not gamble on in larger quantities. I missed a chance to try Ben's take on the resurrected German Gratzer style, which included apples as a flavoring; Saturday I had a tiny taste of the Aztec Ale, which you can think of as a tincture of cocoa and chile peppers. Fresh from the Zwickel, Breakside served us a taste of an upcoming experimental release: the Savory Stout, whose adjuncts include seaweed and miso soup -- sounds scary but judging from the slightly salty creaminess of the young beer, I think it might just work. 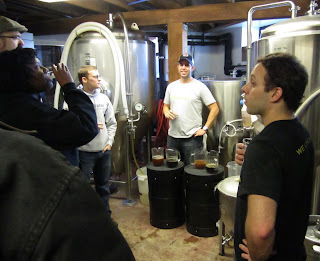 The most experimental beers are released on Wednesdays at 3 PM -- the Savory Stout is coming up March 2nd. The beer for this Wednesday is flavored with chestnuts and fermented with Brettanomyces -- read about it and the Savory Stout in this article on Brewpublic. 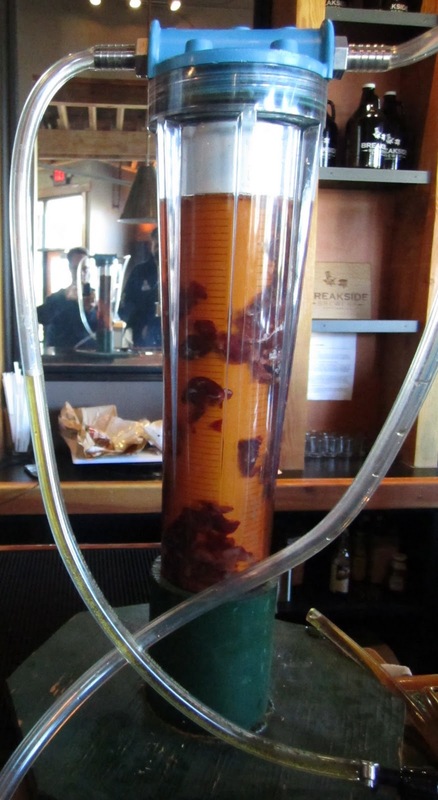 Breakside takes the beer taste explorations in another dimension with their Randall, infusing beers with chiles or other flavors. On Saturday they poured us a taste of their Belgian Royal Brown ale Randallized with vanilla beans and dried cherries. It was delicious -- cherries seem to go naturally with beer, and the vanilla added a round note to a rich beer that tends a little to the sweet side on its own. "Belgian Royal" -- that's clever. I guess you can't use "Belgian" and "Imperial" in the same sentence. I don't have anything to report on the food -- I fled the Zwickelmania crowds -- but the menu looks promising. Kids are allowed in the pub until a certain hour. Of the house standard beers, I tried the Hoppy Amber, which was just how I wanted it to be -- pleasantly malty with nice floral hops. I also tried the one-off hopless Wheat Gruit -- a low-alcohol offering that was refreshing and lemongrassy. It would be nice to see that come back in the summer as a low-octane, low-priced thirst quencher. Now that I've taken the plunge, I hope to make it back to Breakside again soon. Nice little neighborhood pub, in a place that really needed one, with some well-crafted and imaginative beers. If you're biking there, it's not far off the Williams/Vancouver bike highway, or if you're coming from the Southeast like I was, NE 9th Avenue takes you right to it.